In the late 1970s John Lane began publishing poems in magazines such as The Virginia Quarterly Review, Harvard Magazine, Ironwood, Ploughshares, Nimrod, and many others. Just out of college, he migrated to the Pacific Northwest and fell in with the poets and book designers associated with Copper Canyon Press—Sam Hamill, Tree Swenson, David Lee, Bill Ransom, David Romtvedt—and learned the art of letterpress printing funded by an apprenticeship grant from the National Endowment of the Arts. His experiences in Port Townsend introduced Lane to the poetry and life-work of Gary Snyder, who has remained one of his key influences. Sam Hamill and Tree Swenson’s love of fine books was passed on to him and continues to this day through his own small press, Holocene. Since its founding in 1984 Holocene has published many books and chapbooks by writers such as Stephen Sandy, David Romtvedt, Janet Wondra, David Lehman, Deno Trakas, and Thorpe Moeckel. In 1980 Lane moved back to the east coast, accepting one of the first Henry Hoyns Fellowships at the University of Virginia. He studied there with Gregory Orr and Carolyn Forche. In those early days the Hoyns Fellowships were modeled on the Stegner Fellowships at Stanford, affording a writer time to write. Lane stayed in Charlottesville two years, writing poems and becoming a chef at The C&O, a well-known French restaurant, a career move that carried him away from the academy for several years. Through the 1980s he cooked at restaurants and worked as a poet-in-residence at The Oklahoma Summer Arts Institute, The South Carolina Governor’s School for the Arts, and Interlochen Arts Academy. In 1984 Wofford College, his alma mater, invited him back to teach a semester. That same year, he was awarded an Individual Arts Fellowship in Poetry from the South Carolina Arts Commission, and moved to the mountains of North Carolina where he worked for a rafting company (the Nantahala Outdoor Center) and perfected his white water kayaking skills. 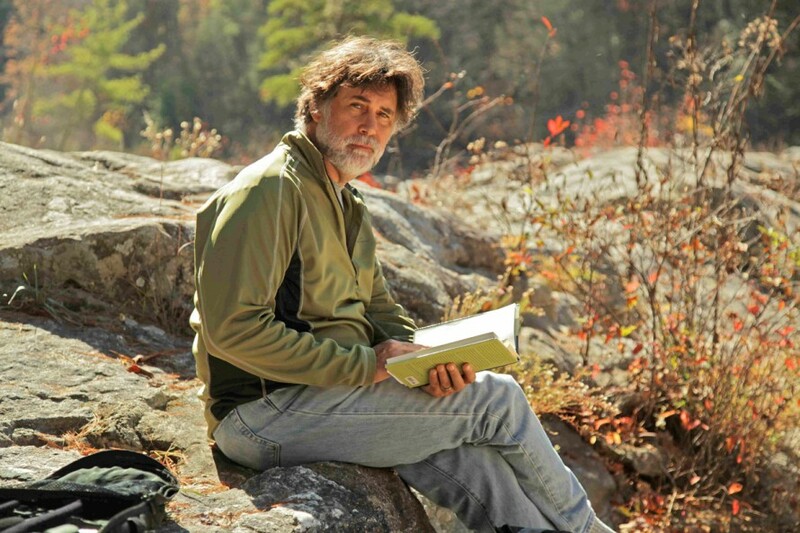 Lane stayed in the mountains until the end of the 1980s when he was invited back, once again, to teach creative writing, film, and literature at Wofford. Lane received an MFA in Poetry from Bennington College in 1995, and was awarded tenure at Wofford in 1999 where he is currently an Associate Professor of English and Environmental Studies. Briarpatch Press published Quarries, Lane’s first chapbook, in 1984. The full collection, As the World Around us Sleeps, followed from Briarpatch in 1992. New Native Press published his second full collection, Against Information & Other Poems, in 1995. Upon publication of Against Information Lane was featured in interviews on Canadian Public Radio & National Public Radio. The book received a positive front page review in The Small Press Review (“Out of Memory” June â€˜95); since then it has been reviewed quite widely and favorably. The Dead Father Poems, his collaboration with artist Doug Whittle, appeared from House & Buggy Press in 2000. In 2003 a sequence of 14 nature poems appeared in Noble Trees from the Hub City Writers Project. In the 1990s Lane began to publish in the personal essay form in The Southern Review, The Fourth Genre, Kestrel, Agni, Orion Afield. In 1994 Briarpatch Press published a small collection of short personal essays called Weed Time: Essays from the Edge of a Country Yard. His longer essays have been about a variety of subjects including white water kayaking, wilderness experience, books, the new folk music, film, digital publishing, and southern culture. A personal essay about Cumberland Island, Georgia appeared in the anthology In Short: Brief Creative Non-fiction, edited by Judith Kitchen and Mary Paumier Jones (W.W. Norton & Co, 1996). In the creases of Lane’s full publication list you will notice also occasional publications in fiction, play writing and screen writing. A one act play, “The Pheasant Cage,” was published by Palmetto Play Service (Seneca, SC, 1995) and produced at several colleges and universities; a screen play, “Mekong,” though still unproduced, has been under option twice, most recently with Lentina Productions. Since 1990 Lane has developed a deep interest in natural history prose. A book-length environmental narrative, A Stand of Cypress was runner-up in the Associated Writing Programs creative nonfiction contest in 1995. He has given papers and written book reviews concerned with literature and the environment, particularly in the southeast. In January of 1995 he participated in “Cross Currents: Six Writers on Environmental Ethics,” a symposium at Presbyterian College in Clinton, SC. The other five featured writers were Rick Bass, Janet Lembke, James Kilgo, David Romtvedt, and Linda Hasselstrom. In 1997 a paper (co-authored with Gerald Thurmond) “Patton’s Run: The Emergence of a Place from Obscurity to Popularity” was delivered at the Popular Culture Association’s annual meeting in San Antonio, Texas. Two long essays, “River Wild,” on paddling 59 miles of the Youghiogheny River, and “Confluence: Pacolet River,” appeared in the anthologies Heart of a Nation and Adventure America, both from National Geographic Books. A book of personal essays, Waist Deep in Black Water (University of Georgia Press, 2002), was widely reviewed (“Lane has a fluid eye in a â€˜world where times moves in more than one direction and no landscape holds steady for long,’ and it’s energizing to see through that eye, open as it is to both light and darkness.” — Kirkus Reviews). In 2001 a prose piece about a Girl Scout camp threatened by development was awarded The Phillip D. Reed Memorial Award for Outstanding Writing on the Southern Environment by the Southern Environmental Law Center. More recently, his book-length narrative, Chattooga: Descending into the Myth of Deliverance River, was the lead nonfiction title for the University of Georgia Press’s fall 2004 list. Since publication it has been widely reviewed in both the popular and academic press. (“Lane’s own writing and observations are good enough to stand outside of Dickey’s considerable shadow.”-Publishers Weekly) Lane’s latest book-length personal narrative, Circling Home, was released by The University of Georgia Press in the fall of 2007. Circling Home is now in a second printing and UGA will release a paperback in early ’09. In 1995 Lane co-founded with Betsy Teter and Gary Henderson a community press and literary arts organization in Spartanburg called The Hub City Writers Project. Since 1995 Hub City has published 31 books (www.hubcity.org), hosted an annual writers conference, and promoted literature in Spartanburg. Over 150 writers have appeared in our publications. In 2002 the organization was the first literary organization to be awarded the Elizabeth O’Neill Verner Award, South Carolina’s highest statewide award in the arts. In 2001 he developed, with Wofford biologist Ellen Goldey, a freshman learning community called “The Nature & Culture of Water,” funded as part of a $250,000 National Science Foundation grant. On this grant Lane was listed as a senior instructor. Since 2002, with his colleague Dr. Goldey, he has taught learning community workshops in New Hampshire, California, Washington State, Oklahoma, and Illinois on the collaboration between science and the humanities around the theme of water. In 2004 Lane and creative writing colleague Deno Trakas recieved $70,000 from the Watson-Brown Foundation to develop a series of courses called “Cornbread & Sushi” exploring the changing rural South through contemporary literature. The success of the 3-course sequence resulted in a book by the same name and a $30,000 grant extension for another year. Lane’s current projects include recently co-hosting ASLE’s 2007 bi-annual conference at Wofford College, working with Christopher Dickey and Brownen Dickey to compile “Digital Dickey,” a site of selected James Dickey readings and interview material to be released as podcasts, completing The Old Rob Poems, a new collection of poetry to be published in 2009 by Horse & Buggy Press, compiling a selection of his three years of Kudzu Telegraph columns published in fall 2008 by The Hub City Writers Project, and beginning the research and field work for Paddle to the Sea, a book-length narrative about important Southeastern water issues framed by a kayak trip from his backyard in the South Carolina Piedmont 200 miles to the Atlantic ocean through the Broad/Congaree/Santee river basin. In spring 2008 Wofford announced a new environmental studies major and minor and John Lane will be the interim director. He has also been named the director of the Glendale Shoals Environmental Studies Center as well. The $1 million center will be housed in a renovated mill office building on The Lawson’s Fork 15 minutes from campus. In 2008 John Lane’s extensive literary papers (letters, drafts, manuscripts, literary business) were acquired by Texas Tech University’s James Sowell Family Collection of Literature, Community, and the Natural World.